A cron job to (re-)issue server certificate of Let's Encrypt and update ELB's certificate on Amazon Linux - It works! Updated at 2016-01-23: Amazon launched AWS Certificate Manager. It should be the easiest way to use certificate on ELB. See more detail at New – AWS Certificate Manager – Deploy SSL/TLS-Based Apps on AWS | AWS Official Blog. Select Policies > Create Policy > Create Your Own Policy > Set Permissions. Create new user at Users > Create New Users. Do not forget to download the user's credentials. 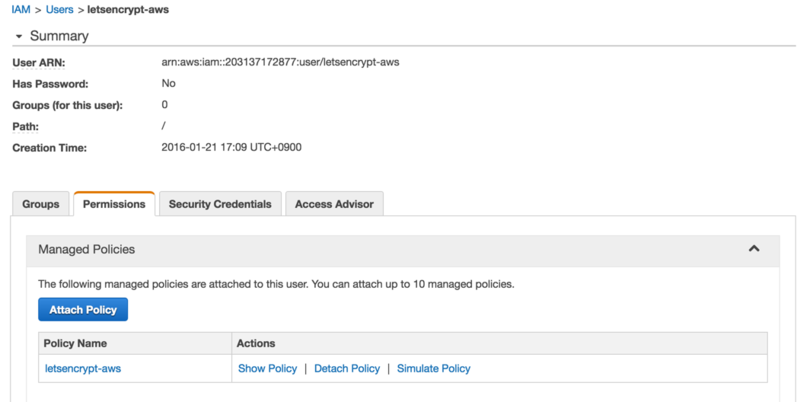 Then attach the policy letsencrypt-aws which you just created at step #1 to the user. Can't find the policy? Try filtering policies by "Filter: Customer Managed Policies". Login to the host, and install required packages. Edit nginx.conf to add a location directive for Let's Encrypt. Restart Nginx proceess to apply the new configuration. Move on to the next step. Congrats. This is the final step! This cron job is going to refresh your domain's certificate on ELB every month. Comment to this article, or create "New issue" at https://github.com/ymkjp/elb_update_cert/issues. This blog has moved to nohup.log since Blogger's mobile experience is not enough good for me. (c) 2010 Kenta YAMAMOTO. Powered by Blogger.